Karen Woodward: Let's Create a Sidekick! Over the past few posts I’ve talked quite a lot about theory, now it’s time for the rubber to hit the road and CREATE a sidekick (or at least begin the process). Please keep in mind that this is an experiment! I’m putting together this evolving story outline as I go (and please feel free to make suggestions). 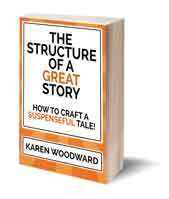 At the end of this series of posts my plan is to have a completed outline for a traditional murder mystery. At that point I’ll bundle these posts up—including this character outline—and put it in a book for easier access. Tip: If you’re creating your sidekick along with me and you find ideas aren’t flowing the way you’d like, try writing longhand. At least, that’s what (usually) works for me! Note: I had wanted to publish this post yesterday, but I was too busy reading Deborah Chester’s excellent book, The Fantasy Fiction Formula. 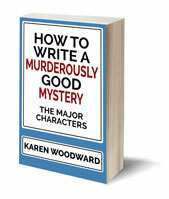 Although (as the title suggests) Chester’s work is focused on creating a fantasy story, many of the things she has to say—for example, about character creation—apply to murder mysteries as well. I just wanted to add this note and acknowledge my debt to her wonderful work. Deborah Chester also has a blog, one I’ve read for years and highly recommend: Chronicles of the Scribe. We’re tackling the sidekick today. As we’ve seen, in a murder mystery, the sidekick is the detective’s foil, they complement the detective and, in so doing—in their very ordinariness (they are more like you and I, but perhaps a wee bit dimmer)—they highlight, they accentuate, the detective’s exceptional qualities. 2. What does the sidekick look like? Since I like to “see” my character, one of the first questions I try to answer is what they look like. Which brings me to a dilemma. When I think about the sidekick I think of him as male, but I don’t have a lot of important, significant, characters who are female, so I thought I should make the sidekick female. But—and I’m not sure whether this is fortunate or unfortunate—I don’t think I can. It seems the sidekick has formed enough in my mind that he has his own opinions! He is about 5’7’’ tall and is thin. For some bizarre reason that hasn’t yet been revealed to me, he likes wearing brown corduroy pants (he’s hipster and likes all things retro) with some sort of checkered shirt. He has medium brown hair cut short but not mercilessly so. He has a beard and likes to wear a plaid flat cap. 3. Names: First, Middle, Last. Nickname? J.K. Rowling did this well! I’ve always admired the names she chose for her characters, at least the ones in the Harry Potter books. For example, Albus Dumbledore, Hagrid, Petunia Dursley, and Professor Quirrell. With the sidekicks name, I have the opportunity to plant a characteristic, a suggestion, an idea, in a reader’s mind. For example, to me “Dumbledore” makes the character seem approachable. Friendly. Kind. It’s certainly not the name of a villain. “Snodgrass” is a name I would give to a character who sits on strata boards and is a stickler for the rules. Which brings me to another point; if you give a turncoat character—a traitor—one that is exposed (say) halfway through your story, you can give them a name that makes them feel friendly and approachable and in so doing subtly encourage your readers NOT to suspect them—that is, not until it’s too late! Note: I find that the tag embedded in a name usually refers to that character’s mask, not their inner person. So, for instance, Dumbledore’s inner man wasn’t necessarily approachable and kind, but that’s okay because the primary purpose of the tag is to make the character more memorable. Of course you could name your protagonist John Smith—and there might be good story reasons for this. Perhaps one of your character’s distinctive qualities is that they are bland, faceless, not in the least extraordinary or noticeable. Joe Beige. This might be a terrific quality for a spy or infiltrator. As I wrote this the name “Dan” or “Daniel” came to me. I don’t know how memorable that is! But it does have the sort of overtones I’m looking for. I love the biblical story of Daniel and the Lions Den. My character has that kind of honesty and courage. Now, what about the last name? “Daniel” gives me an idea; it would be nice if the last name reinforced the qualities the name evokes for me. How about “Daniel Lions”? A bit obvious? Oh well, I’ll keep the name until something better occurs to me. 4. How old is this character? If I don’t have a clear idea of when the character was born I like to think of which astrological sign fits the character best. If that doesn’t work, I sometimes play with tarot cards and see which card seems to especially ‘fit’ the character best. Since each card is paired with an astrological sign, this is a way fixing the month. I’m not sure about the exact year but I think Dan is around the same age as the detective which would put him in his early 30s. Now for the difficult bit: in what month was Dan born? I like to go through my tarot deck, or look at Rider-Waite-Smith cards online. Usually a card will stand out. Which is what just happened! I think the Four of Wands is Dan’s card. Dan is going to be the relationship character (although, to be fair, I knew this before I fixed on that card!). The detective and sidekick are going to be buddies. This is a card of celebration, togetherness, harmony. Strength. It represents stability (especially in the Waite deck). In any case, this means Dan was born sometime between April 11th and the 20th. Further, it looks like the Four of Wands is on the cusp between pentacles and swords. Which makes sense! It’s been a while since I studied the tarot, but the suit of swords has to do with the intellect while pentacles has to do with grounded emotion—or at least that’s how I think of it. So, in a way, this could be a very balanced character. Also, since Dan was born April 11th, he’s an Aries which fits with how I’ve been thinking of him. He’s a brave leader who prefers being in the thick of action. On the downside, Dan can be impulsive and stubborn. 5. Do you want readers to (overall) like or dislike this character? Why should readers like or dislike this character? Why should they root for him or her? Or, alternatively, why should readers boo the character and want him to crash and burn? Since Dan’s the sidekick and one of my main characters, I would REALLY like readers to like Dan. Heck, I want them to love him! Which means I’ve got to give them reasons to love him. Which brings us to Dan’s personality traits. If Dan has more positive traits than negative ones and these traits dominate his interactions with other characters, chances are readers will like him. On the other hand, if I gave Dan more negative traits than positive ones and I let these control his interactions with others, he’s NOT going to be liked, let alone loved! 6. What are this character’s personality traits? Positive: Intelligence, honesty, integrity, honor, loyalty, reliability, determination, competence. Negative: Dishonesty, sneakiness, cheating, vagueness, indecision, betrayal, insincerity, tardiness, irresponsibility, cruelty, and timidity. Chester didn’t intend these to be exhaustive lists, but I thought they were an excellent start! She suggests that primary characters have around 6 personality traits. Since we want readers to root for the sidekick we’ll start by giving him 4 positive traits and 2 negative ones. If I had wanted readers to root against this character I would have done the opposite and given him 4 negative traits and 2 positive ones. Note that the numbers “4” and “2” are approximate, let your own sense of the character guide you. If you’re drawing a blank, think about a person you respect. What is it about this person that led you to feel about them the way you do? Or perhaps think of one of your favorite characters from a book, TV show or movie. If you were to write up their character sheet what personality traits would you assign to them? So what are Dan’s personality traits? I already know some of them but it’s not difficult to fill out the list: Dan is intelligent, honest, loyal and very determined. He can also be impulsive and stubborn. 7. What tags will demonstrate these personality traits? I see this book as the first in a series. In this story the sidekick has his own agenda. He wants to get information about his sister’s death from the detective, information he can’t just ASK for. So he’s going to be sneaky. His intelligence comes into play as he schemes. That said, the detective is MORE intelligent than Dan so he knows what his sidekick is doing and, for whatever reason, leaves him to it. Perhaps he knows Dan won’t believe him if the detective just hands the information over. The detective wants to make an ally of his late wife's brother, a true ally. Why? Because the detective suspects the brother knows all about his family's business, their secrets. Secrets that his wife, even though she was very much in love with him, took to her grave. When the detective confronts the sidekick, Dan doesn’t lie—even though that would be the easiest thing to do. The detective is loyal to his sister, to her memory. Toward the end of the story, Dan is also loyal to the detective. They go from alienation to fraternity, from separateness to togetherness. Dan is extraordinarily determined. This is his primary trait. Before Dan connects with Alex, before they begin working together on the case, Dan is single-minded and decisive. But after he gets to know Alex, Dan begins to question his goals, his secret agenda and, as a result, does a few things on impulse with mixed results. 8. How often are you going to use each of these tags? For now, I’ll pick two or three tags of behavior and appearance and use them when I introduce the character and every time, after that, they’re re-introduced after some time offstage. 10. What is the sidekick’s primary story goal? The sidekick’s primary story goal is to help the detective unmask the murderer. 11. What is the sidekick’s personal goal? 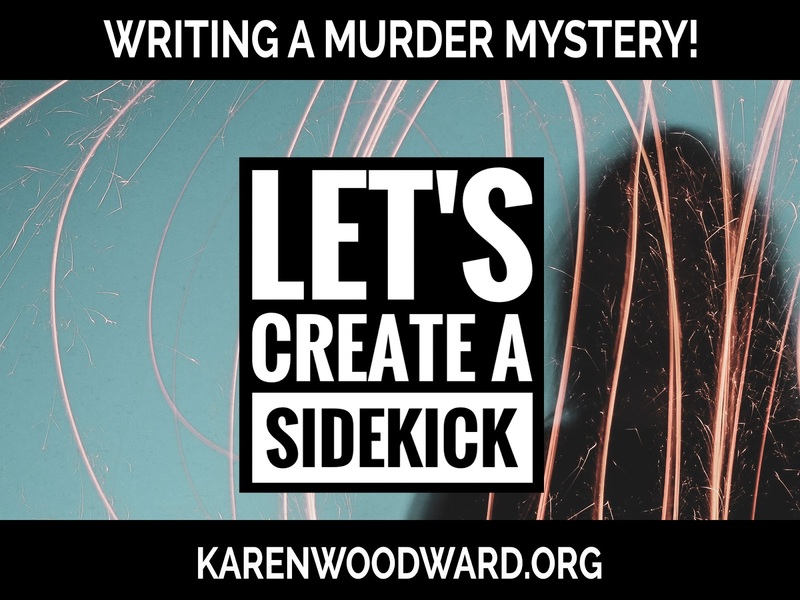 While the sidekick’s personal goal hooks up to the main arc—that is, it needs to help the detective fulfill his story goal of identifying the murderer—it is a story all on its own. Which is to say that it’s a subplot. Dan is going to succeed in recovering the object (or whatever), but instead of incriminating Alex it will bond Dan and Alex. In future books, they will join together on a quest to uncover who was responsible for Alex’s wife’s death. At least, that’s my idea. This may change. 12. Why does the sidekick have this particular personal goal? Alex became overly curious about his late wife's family. He was warned to back off. When he didn’t, Alex’s wife defended him to her family and, ultimately, tried to leave. The family wouldn’t stand for that and had her killed. At least, that’s what Dan (her brother) believes. Note: If what I just wrote doesn’t make sense go back and reread the post where I began creating the detective. Keep in mind, though, that some elements of the story may have evolved since then. 13. What other character is most important in Dan’s life? Why is this other character so important to Dan? Apart from the detective, Dan’s late sister is the other character who is most important in his life. The only other person that comes close is his mother. There is no love lost between him and his father. Lucy is important to Dan because she was family, but also because she stuck up for him when they were kids. His parents didn’t, but Lucy did. - Indicate the character’s personality? Although intelligent, honest, loyal and determined Ben has trouble completing things. He is passionate and committed for awhile and then just moves on. As a result his apartment is littered with the husks of abandoned projects. - Indicate his or her habits? Ben is NOT a neat-freak—far from it—though he’s not a complete slob either. I would describe his place as comfortably messy. - Indicate his or her tastes? Ben likes food, though he’s not a cook. He likes french fries, beer and burgers. If he really likes a girl he may try to cook for her, but when he does it looks like something exploded in the kitchen! - Indicate his or her activities? Unlike Alex, Ben doesn’t go in for extreme sports. Fishing is more his thing. His father fished and they spent many blissful days sitting in a rowboat, poles in the water, listening to waves lap against the hull. 21. If Ben’s lair were on fire and he could only rescue one thing, what would it be? I’m not sure if it’s Ben’s MOST prized possession, but he treasures the fishing rod his Dad gave him when he graduated from high school, the one that hangs on his wall. 22. What is this character’s special skill? He fishes and ties his own lures. 23. What is Ben’s superpower? By “superpower” I mean something—for good or ill—that a person is great at. For instance, my superpower is losing things. Seriously. I’m great at it! Even as I child I quipped that my bedroom had a roving black hole which indiscriminately gobbled up all manner of things. I know people whose superpower is putting others at ease in a social setting. Others have superb memories. Some folks are wonderful cooks: they can take any ingredients and create something delicious. So, what is Ben’s superpower? What is the one thing he does exceptionally well? Provisionally, I’m going to say that his superpower is honesty. Ben doesn’t play games. He isn’t insultingly, brutally, honest, but if he says something you don’t have to search for hidden agendas. He says it simply because he means it. Of course, this can occasionally get him into trouble! 24. Why is Ben so honest? I’m not sure. It’s the way he is. His dad and mom were honest with him, as were his friends. 26. How has being honest affected Ben’s life? His honesty has gotten him fired a couple of times! Also, perhaps he was a whistleblower at one of his jobs. One of the tech companies he worked for was doing something that lined their pockets with cash but endangered lives. Ben blew the whistle. Even though he should have been protected, the company fired him and made sure he wouldn’t be able to find another job in tech. Ben was making good money but, as a result of his firing, had to sell his flat in London and move to the small town of Meadowmead. Now he works as a laborer and drinks too much. 28. Describe any and all minions this character has. For example, Sherlock Holmes had the Irregulars. As far as I know, this character doesn’t have minions. 31. Which character will be Ben’s foil? The main character, the detective, is Ben’s foil. Just as Ben’s normality, his ‘ordinariness,’ accentuates Alex’s extreme oddity so Alex’s eccentricities highlight Ben’s normality. 34. What were Ben’s parents like? I’ve described Ben’s relationship with his dad, I don’t quite know what his relationship was with his mom. Perhaps she passed away when Ben was a child. 35. What was Ben’s relationship like with his parents? Were they good to him or did they mistreat him? Ben idolized his father and, in general, his dad treated him well. There are more—many more!—questions than these, but I won’t include them here. This is (hopefully!) a decent beginning. By the way, you may have noticed that I’ve skipped some numbers. I’ve created a master character sheet but didn’t post the questions I couldn’t yet answer. What is your sidekick like? I’d love to know! Today I’d like to recommend: Outlining Your Novel: Map Your Way to Success (Helping Writers Become Authors Book 1), by K.M. Weiland.